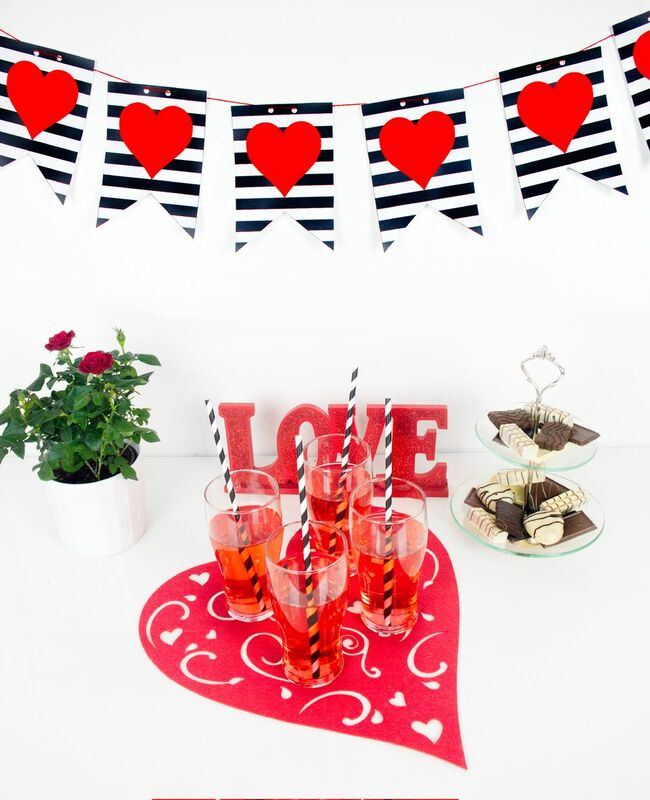 Love is in the air this February so go ahead and decorate your home or cubicle at work for Valentine's Day with a modern black and white striped banner with decorative heart detail. This printable banner is free to make, all you need is the template, access to a printer and some string and you can make this Valentine's Day banner any size you might need from just over a table, to long enough to wrap around your living room. Begin by downloading the Valentine's Day banner template and printing out several pages of the template on either plain white printer paper or for a more durable banner print the design on sheets of white cardstock. The template has two banner flags per page, for a short banner 4 printed sheets giving 8 flags for the banner should be enough but for a larger banner, you may need to print many more pages depending on the desired length. Cut out all the flags on the printed templates using scissors. Once all the flags are cut it is time to assemble the banner, to do this cut a piece of string, yarn or twine to the length you wish the banner to be. There are two methods to attach the flags to the string. If you do not have a single hole punch you can lay down the string and equally space the flags on it. Use a small piece of tape at the top of each flag on the back side to attach the flag to the string. The easier way is to punch two small holes using a single hole punch at the top of each flag about 1/2 inch apart from each other. Once all the flags have two holes simply pull the string through the holes by weaving the string in and out. Finally, tie or tape the string to the wall and position the flags as they can be moved along the string. This method is more durable as you do not have to worry about not evenly spacing the flags while taping or about the flags falling from the tape un-sticking.